In the past couple of years, at the Family Dollar store in town, the week before Halloween they take the Halloween stuff down and replace it with Christmas stuff. I’ve already had alleged Christmas music— Jesus-free— imposed on me at a store when I went with my mom to pick up her prescriptions. 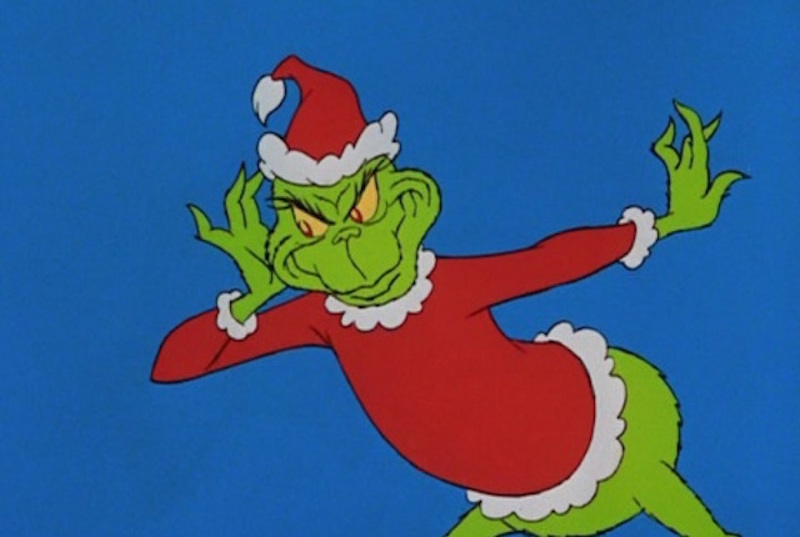 Constant Christmas causes stress, even though sentimental people may love months of Christmas music and Christmas movies on TV. It reminds people that they have to buy gifts and plan parties and events, send out Christmas cards, and so on. And what do retailers now want people to do with all that stress? Buy themselves new TVs, computers, and cars. People can always max out their credit cards and spend the rest of the year paying them off— and paying loads of interest which makes any Christmas ‘deals’ that actually were good deals to no effect. And in all this retailer-induced madness, what happens if someone mentions the name of Jesus Christ? You’re a party pooper. Or, worse, you are a hater who is bigoted against Jewish people, Muslims and atheists. Which in the minds of the politically correct means you want those people to die and are probably willing to bring that about yourself. Yes, that means when you put up a sign on your lawn that asks ‘Keep Christ in Christmas’ liberals are reading that as ‘I want to be like Hitler’ and they will whine to their friends about all the ‘haters’ in their town. The church does not teach us to celebrate a Christmas buying fest with months of self-indulgence. The church teaches us to celebrate Christmas eve and Christmas day by going to church and worshiping. Before Christmas, we have the four Sundays of Advent to celebrate. It begins on Dec. 3rd this year. Advent is not a good church season in which to buy yourself a new smartphone or car, or eat your favorite Christmas candy or cookies every day. Originally Advent was considered a lot like Lent. You made sacrifices as a sign you were sorry about your sins. In the Eastern Church I believe Advent was called ‘Little Lent’. What are YOU giving up for Advent? Keeping Advent and Christmas in our culture is hard. Your workplace may demand that you participate in ‘Winter Holiday’ parties— Jesus-free Christmas celebrations. If you are a parent who is still letting your kids be raised by wolves— go to public school— they may be assigned to write Jesus-free Santa Claus letters. In our area the schools traditionally send these to the local paper to be printed in a special pre-Christmas edition so all the grandparents in the area can chuckle over all the kids ‘cute’ and usually greedy letters. Of course the schools will never mention the truth about Santa Claus— that he is a mere nickname for an actual human person, Saint Nicholas, a fourth century bishop (senior pastor) whose feast day is December 6th. That is the traditional day for gifts from Saint Nicholas, usually, in the old days, mostly candy and an orange, which at that time were not everyday fare for kids but a special treat. My mother, born in 1927 to German immigrant parents, remembers celebrating St. Nicholas day, even though they were Protestants. It was a general celebration in Germany. If you want to celebrate Advent and Christmas in a Christian way, you have to kind of step back from our culture. Stop watching so much secular TV when the rush of Christmas ads begin, even though that is earlier each year. I have a hard time giving up TV because I live alone and putting the TV on makes me feel less lonely. So I start changing the channel to EWTN, a commercial-free Catholic channel, most of the day. I used to sometimes watch the Shepherd’s Chapel channel, which is a commercial-free Protestant Bible study channel, but I don’t agree with all of the theology, especially not now that I’m Catholic, so I don’t watch as much. If you have kids that are TV or internet addicts it may be next to impossible to get to detach from that bad influence without a major battle. But our culture has gotten so far off the track that people are complaining when someone asks for prayers in the wake of a natural, criminal or terrorist disaster. Because ‘prayers don’t help.’ That’s how the TV and internet are raising your kids. And that’s a year-long problem not just an internet one. But an Advent celebration might be a way to wean your kids away from these bad influences, and, most importantly, towards good ones. Like having days during Advent when the only television watched is EWTN and/or Shepherd’s Chapel. HINT: in the Catholic celebration of Lent the sacrifices you are making usually have Sundays off, since Sunday is always a day of celebration of the Resurrection of Christ. So if you are avoiding buying and eating Christmas candy or cookies in pre-Advent and early Advent, you can allow yourself a little on the Sundays of Advent to make things more festive. Santa Claus is real. And slaps heretics. Forget the roly-poly Guy in Red that exists to sell product during the November-December shopping-holiday season. Saint Nicholas is real. He’s just not who people think he is. He was a fourth-Century bishop of the Catholic church. Not much is known for sure of his life, but there are a number of legends about him. There is the one about the three poor girls who were about to be sold into prostitution because their father had no money for their dowries. St. Nicholas took money from his own inheritance and threw it in a window of the poor family’s house, so that enough money for dowries for all the girls was provided. Another cool story was that Nicholas was at the Council of Nicaea in 325, and slapped the arch-heretic Arius in the face. He lost his bishop’s office and was thrown in jail for that, but the legend says that the Blessed Mother got him out of that one, and he was restored to his former position. Today is the feast day of Saint Nicholas, December 6th. In some European countries the custom is to put out the Christmas stocking on the eve of Saint Nicholas day, and he will fill them by morning. Some say with candy, some say with slapped heretics. 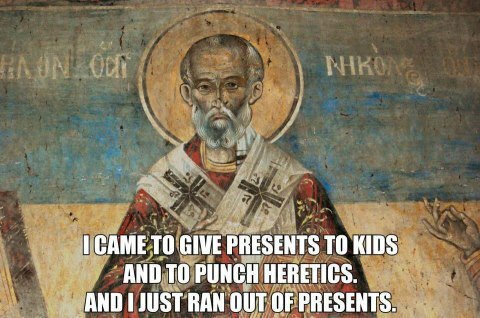 My mother told me that story (minus the heretics) because even though her family was Protestant, they still celebrated Saint Nicholas day. More info on Saint Nicholas. A heretic is defined as a person who once professed the true Christian faith, but who went astray and began teaching false doctrines. So a person who was born into a Protestant church or into a sect is not a heretic in the eyes of the church. Just the folks who once knew the truth but went against it. People with Asperger Syndrome— Aspies— have a great deal of difficulty with social interactions. That is, with making friends, and maintaining friendships and other social relationships that already exist. Sometimes it seems that the rest of the world is playing by a social-interaction rulebook that we Aspies aren’t allowed to read! At ‘this time of year’, one easy social interaction that even Aspies can easily get right is the Christmas card custom. Yet many of us, perhaps out of poverty, haven’t kept up with the Christmas card habit. But it’s a great way to let other people know that we like them, that we are not indifferent to them, that we want to keep up the social relationship. Christmas Card List: Who should you send cards to? Family members, for one thing. Close family members must make the list. If you have cousins you don’t see every year, send to them if you want to keep up that relationship. Send cards to your friends, even if they are the kind of friends who think of you as just an acquaintance. Send cards to people like your therapist, your pastor, and the guy you buy your hay from. It’s OK to send cards to almost anyone you know in the sense of ‘have actually talked to on several occasions’. Pen pals are also OK. If there are people you’d like to be friends with, or ‘more than friends’ with, and you have never actually talked to them and are not sure they even know your name, don’t send a card. You are really only a stranger to that person, and Christmas cards from strangers can be seen as strange, or even creepy. Don’t be that guy. The Cards: ideally should be relatively ‘normal’. Something like the ones other people send. Don’t send cards in Chinese to people who don’t speak Chinese (especially if you don’t either). And remember Christmas is a Christian holiday. It’s okay to send ‘Happy Holidays’ cards if you are not Christian, but please avoid creating your own angry-atheist holiday cards with a pro-atheism message inside. Whether you agree with that or not, the social rule is that this isn’t appropriate in Christian cards. Hard-sell evangelism messages also violate the social rules about Christmas cards, though cards with Bible verses and gentle Christian messages are tolerated in most circles from Christian senders. Hanukkah Cards: If you are Jewish, why not send out Hanukkah greetings to everyone on your list? As a Christian, I can assure you, I would love to receive a Hanukkah card! It would not offend in the least. If you are worried, write ‘Merry Christmas’ inside cards for non-Jewish recipients. Signing the card: you can just sign (or print) your name. Some people have the name printed on their cards, but signing it yourself shows that you care. You can also add a greeting of up to, say, five words before the signature. Such as: ‘Sincerely, Nissa Annakindt’ or ‘Love, Nissa Annakindt’ or ‘May God bless you and yours, Nissa Annakindt’. This is OK in a Christmas card to any person on your list. Signing cards to close family members and friends: when you are signing the card to your mother or to a best friend you see every day— people you have a very close relationship with— you can add a bit longer greeting to your card-signing. Up to three sentences, say, of friendly greetings. Like: ‘Dear Uncle Odo, It was great seeing you at Thanksgiving. I hope your hip is better. Have a happy Christmas.’ Don’t mention sad things like Uncle Odo’s son being arrested again, or overly personal things— remember that anything you write in a Christmas card should be things it is OK for the recipient to show to other people. 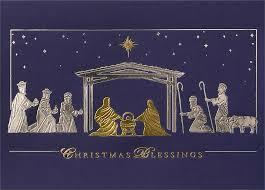 The Christmas card letter: there is a custom of sending out a mass produced Christmas card letter each year. This can be a problem for Aspies as we may have difficulty figuring out what to write that is appropriate. My advice is to skip it for now. If for some reason you feel you need to do it, read other people’s Christmas letters, and get a normal (‘neurotypical’) person to read over your letter to see if it falls within the social rules for Christmas card letters. Reciprocity: The social rule is that if a person sends you a Christmas card, it is polite to add them to your Christmas card list. If they don’t send you, and if they didn’t omit it for health reasons, it’s OK to cut them from your list if you like. (Lonely elderly people who can no longer write Christmas cards any more might be looking forward to your card— visit or call them as well if you can.) If your relationship to someone you added to your list is not very close, and they don’t send you a card back, perhaps it’s best to cut them from your list. If you want to not exchange Christmas cards with a certain person— your neighbor from when you were in fifth grade that you haven’t seen since— just don’t send them a card this year. So, those are my rules for Christmas card sending for Aspies. Because, as an Aspie, I don’t always send off the right non-verbal clues that I like people and want to be around them, sending out cards may, I hope, let people know that I really do value the relationship. Are you an Aspie? What experiences have you had sending out Christmas cards? Did you send cards out this year? Are you a non-Aspie? Have you ever had trouble figuring out some of the social rules regarding Christmas card sending? Do you think sending Christmas cards is a good way to keep up with family and friends?